Several questions have been raised about BCSA’s Stockdog Of Distinction (SOD) and SOD-Excellent awards; as well as on BCSA’s support of some USBCHA-sanctioned open field trials. A few members have contacted the BCSA board to express concern over or disagreement with these policies, and we are aware that there has been recent conversation on some email discussion lists about this topic. Here we attempt to address some of the concerns raised, and dispel some myths that are being propagated. If you have other questions not addressed here, or would like to offer the BCSA board your opinion on the subject, you can use the BCSA Suggestion Box or email our Corresponding Secretary, directly. The BCSA board always welcomes membership input, and considers and replies to all correspondences. When was the Stockdog Of Distinction (SOD) Award Developed? This award was first proposed to the board in 2005, suggested by the chair of our Herding Committee, Claudia Frank, as a way to recognize dogs that have shown excellence in herding. The board approved the award concept at their September 2005 meeting. Denise Teal offered to chair the project. The following March, the description and wording were ready for roll-out, but the award still needed a moniker. A description of the award was posted on our website, and a BCSA_ANNOUNCE email sent out requesting suggestions for a name. Megan Quigley’s suggestion of Stockdog of Distinction was chosen, and in April 2006 another BCSA_ANNOUNCE message was sent letting the membership know. The website description of the award was finalized at that time, and still notes that the award was approved in 2005. When was the SOD-X Award developed? After we had five winners of the SOD award, it seemed time to raise the bar, and identify a higher level of the award to encourage people to strive to greater achievements in competition. Late in 2007, Claudia proposed that the SOD-X Award be added, and the board approved it in January, with the defining feature that the winner earns even more points at Open trials. What is the purpose of the SOD and SOD-X Award? Because one of BCSA’s primary missions is to preserve the working heritage of our breed, the SOD award system is intended to highlight excellence in this area. It is meant to inspire BCSA members to get out and compete in herding trials, which are a good metric to compare your breeding stock with that developed by other breeders. For many centuries, dog breeders have used shows and trials as a means for evaluating breeding stock and sharing knowledge. Why does the SOD award require placement in Open classes at ISDS-style trials? It was important that one component of the award be to require that a dog is proven in the open field, versus only competing in arena trials. The Border Collie is a highly developed working dog for this particular purpose, and the skill and instinct required to control livestock in a large area without the benefit of a fence line is very different from working in a small farm arena. Though AKC offers such style of work in the B course, AKC B courses are still relatively few and far between, and very small in scale as compared to ISDS-style trials. So, they are still not the best test of good Border Collie-style work. Thus, it was felt that to declare a dog truly a “Stockdog of Distinction”, it must prove its mettle in the traditional forum in which Border Collies have been tested for more than 100 years, the ISDS-style trial. Do the SOD and SOD-X awards require that recipients compete in USBCHA trials? No. There are many ISDS-style trials held around the country that are not USBCHA sanctioned. The award did originally specify USBCHA sanctioning, but when questioned by a member, the board changed it to just describe open field work at an ISDS-style trial. That was the original intent of the award, was to put the focus on open field work, versus arena work, since open field work is the primary purpose for which our breed was developed. Whether a trial is sanctioned, and by whom, is irrelevant to the intent of the award. I’m concerned that BCSA is “promoting” USBCHA by encouraging members to compete in ISDS-style trials when some prominent USBCHA members have expressed “anti-AKC” sentiments. Should BCSA be supporting an organization that does not offer reciprocal support back to us? It is true that some USBCHA members are not supportive of our organization and do not feel that we share the same goals. But we beg to differ, we feel that the goals of both organizations are the same—to preserve and protect our breed, and to inspire Border Collie breeders to continue to develop excellence in the field, and sound, healthy, well-constructed dogs. And, not all USBCHA members and competitors are in disagreement with our club. So, it’s not fair to stigmatize an entire organization’s membership based upon a few outspoken individuals and declare that we won’t cooperate with any of them. I notice that BCSA sometimes gives money to support USBCHA trials, such as the Kentucky Bluegrass and the National Sheepdog Finals. Why do we give money to an organization that sometimes speaks against AKC? Our club has, for many years, felt it important to financially support open field trials. We feel that their continued accessibility is imperative in providing a forum for comparing breeding stock and preserving our breed’s working ability. Our club gives several grants each year to help fund AKC B course trials, and our board has always been willing to consider other requests for funding of non-AKC trials as well if they feature open field work. It doesn’t matter who sanctions the trial, or if it’s sanctioned by anybody at all. If the trial features open field work, it is good for our breed and aligned with our club’s mission to promote working heritage, so we would like to support as many such trials as we can. And, we feel it’s important to promote peaceful relations amongst all Border Collie owners. Sometimes humble kindness is the first step towards a truce. And we feel it’s imperative to discourage the us-and-them mentality, instead, we should focus on our common goals and love for the breed and its heritage. The organizers of trials who have accepted our donations have always been gracious and appreciative of the gift, and harbor no ill will towards BCSA. And it’s important to note, BCSA has never given money directly to USBCHA, it has only offered financial support of actual trials. I notice that in 2007, BCSA donated money to the newly founded Border Collie Health Foundation (BCHF) to sponsor Bill Berhow in the USBCHA Finals. I’m concerned about funding a particular person, and wonder why this decision was made. BCSA has supported the National Sheepdog Finals for several years, again because we feel it is a competition which is pivotal in the preservation and continued development of our breed. With trial sponsorship, a free catalog ad is awarded. This year, we felt it would be useful for the new BCHF to benefit from the advertising, to raise awareness of their budding organization, so we gave the sponsorship money to them to spend. Their board chose to sponsor Bill Berhow, who is a member of their board. It’s important to keep in mind that this money isn’t “given” to Bill, it’s used to help fund the trial. 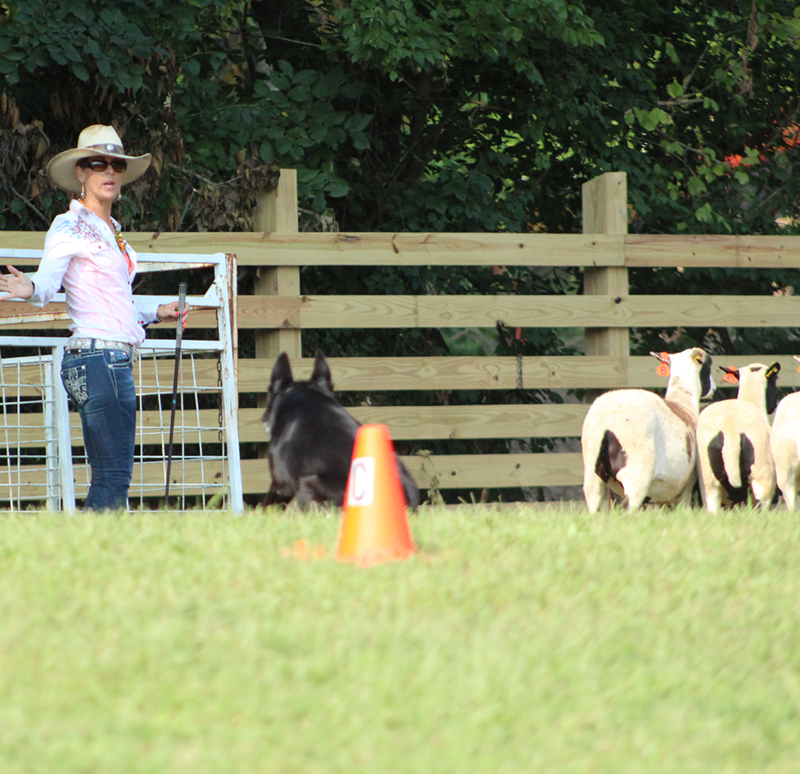 A competitor sponsorship means that the sponsor’s name is read each time the competitor steps to the handler’s post. This was important to them, both to have additional exposure to the BCHF’s name, as well as raise awareness that Bill is involved with the BCHF since he is a respected member of the working dog community. It’s important to the BCHF’s future success that they gain buy-in from all Border Collie fanciers, not just those from one organization or another. I’ve heard that USBCHA does not allow AKC approved Herding Judges to preside over their sanctioned trials. Is this true? No. USBCHA does not allow AKC approved Herding judges to preside over their Finals competitions. But all other USBCHA-sanctioned trials have no restriction, and some of our AKC judges are well-respected USBCHA judges and frequently preside over non-AKC trials. We actually feel this is very important, because the AKC Herding Program is still very new, and relies heavily upon expertise brought by judges from other venues that have been around much longer. So, we value judges who are approved by more than one organization and the experience they bring. If BCSA thinks that ISDS-style trials are the best way to test a Border Collie’s working ability, why doesn’t BCSA just offer these trials ourselves? We would love to, and maybe someday we will achieve that goal. But, right now, we are limited in resources—both financial and volunteer; and we have many goals besides just this one. So, for now, the wide availability of ISDS-style trials hosted by different local organizations is the most practical way for us to encourage people to test their dogs in a forum most geared towards Border Collie-style herding. I’ve heard that you have to be a USBCHA member to compete in their trials, or that your dog must be ABCA-registered to compete in USBCHA trials. Is this true? No. For people attempting to qualify for the National Finals, they must be USBCHA members to have their points tallied. But all other USBCHA and other ISDS-style trials are open to any person and any breed of dog, and the dog does not have to be registered with any organization at all. It’s important to also remember that USBCHA and ABCA are two distinct organizations, the former sanctions trials, and the latter is a registry. The ABCA has been much more outspoken about AKC issues than the USBCHA, which concerns itself mostly with the administration of trial sanctioning and Finals qualification. I’ve heard that BCSA members everywhere are “up in arms” over the SOD award and our club’s assistance to USBCHA-sponsored trials. What is the BCSA board doing about this? Actually, though the SOD award was announced to the membership over two years ago, January of 2008 was when we received our first feedback about it from the membership. And, we have been sponsoring USBCHA trials since 2003, and have never gotten any negative comments about that either, until now. All board decisions are recorded in the minutes and published to all members via Borderlines, our website, and BCSA_ANNOUNCE. So, membership could hardly claim a lack of awareness of these programs or decisions and has had the opportunity all this time to comment to the board on them, but never has. Since we are an AKC Parent Club, is it a problem that we include non-AKC titles and achievements in the SOD program? Is this allowed? Actually, we’ve been recognizing achievements in non-AKC venues for many years. Our Versatility Program recognizes titles from United Kennel Club (obedience), USDAA (agility), NADAC (agility), North American Flyball Association, AHBA (herding), ASCA (herding) and USBCHA. Many AKC parent clubs recognize achievements outside of the bounds of AKC events and titles, for example, many of the breeds that do “water work” have no AKC venue in which to display their talents, so they ALL cite external programs for their performance recognition awards. And, many of the “field” breeds highlight accomplishments in other venues as well, even breeds where there may be some political contention between AKC and the other venues. So, this is not a new precedent for us or other AKC Parent Clubs. That said, comments are always welcome, and though it’s not clear why this has suddenly become a cause for concern after several years, we do seriously consider all input from the membership. All members are encouraged to give feedback to the board and to respectfully disagree with decisions made—that is what democracy is all about! Many of the day-to-day decisions we make are on tough issues, subjective and controversial subjects where the “right” answer isn’t always clear. We do our best to use our own personal judgment in every vote we cast, and we often don’t agree even amongst ourselves! And, we’re only human; sometimes we make mistakes and poor decisions, or are lacking information at the time a decision is made. But we do try to make corrections to the course when we feel we were off base, and we work hard to be open to criticism. And, other times, members complain to us, but once they hear our rationale and the “full story” they reverse their stance and express agreement with the decision. It is hoped that this FAQ will at leas clarify our reasoning, even if we don’t all agree on every point. As of January 11, 2008, the board has received four comments expressing disagreement with the SOD award and USBCHA trial sponsorship. This represents less than 1% of our membership base; but we do take it seriously when people take the time to write to us because not everybody does. In fact, we often wish more of our members would express opinions, so we know you care and are actively engaged in driving the direction of our Parent Club! We will continue to monitor this subject, discussion, and input related to it and will weigh it when future decisions are made.